"The foods in this easy recipe are powerhouses of nutrition. Why these foods are good for you: high omega-3 fat in salmon; antioxidants in orange rind, scallions and garlic; anticoagulant activity in ginger; and eating fatty fish could prevent an astounding 80% of sudden deaths from heart attacks, Harvard investigators say." Grilled salmon is treated to a simple and flavorful marinade. I've made this recipe a few times and always get rave reviews from my dinner guests. 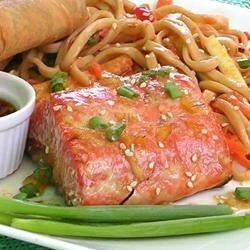 It is one of my favorite salmon recipes. Very good! excellent, it's like an orange-teriyaki sauce. I had this on tuna steaks and it was wonderful. Everyone that I have served this to is blown away...it's a big hit and its quick to make. Like to serve it over salad.